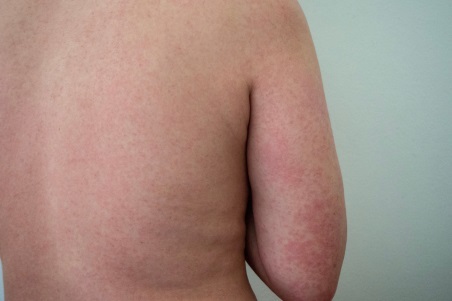 Rubella (also called German measles) is a viral infection that spreads very easily. It usually affects young children. The symptoms of rubella are usually mild. They include a rash, fever, swollen neck glands, and sore joints. When someone with rubella coughs, sneezes and talks, they release droplets into the air. You can catch rubella by breathing in the droplets. Rubella is very dangerous to an unborn child. It can disrupt the development of the baby and cause a wide range of health problems. These can include blindness, deafness, heart defects and brain damage. Since the introduction of the mumps, measles and rubella (MMR) vaccine, rubella is now rare. Vaccination is the best way to prevent measles. The MMR vaccine is used to prevent measles, mumps and rubella. Children receive this vaccine at 15 months and 4 years as part of the National Immunisation Schedule. Rubella usually gets better without treatment in seven to 10 days. Information about the risks of rubella in pregnancy to the unborn child. NHS – Rubella. Retrieved November 2017.